Will History (and people) love Barack Obama? 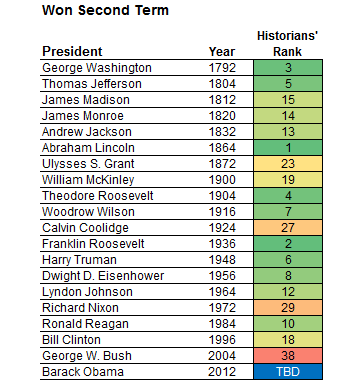 In a new 538 post, the author Nate Silver spends a lot of energy proving the unsurprising: that presidents who serve longer, and win larger re-electoral margins, are better regarded by history—or at least by historians. If this is truth I suppose that the reelection of Barack Obama will confirm it. The President of the U.S. is about one of the most loved Presidents we have had in the last decades and its correlated hate is also one of the highest. In the time previous to his election I read hundreds of comments in my Facebook profile explaining how the “World as we know it was going to end if he got the reelection”. Luckily, the world is still going on and chances are that the ideas of Obama & Co. will continue reigning and being popular. Contemporary History (specially if read through the American lenses) is quite ridiculous. Their exceptional-ism is impressive and how they read and understand history is also ludicrous. 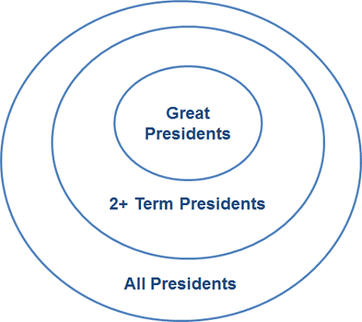 We might divide the presidents into three basic groups: good (those who rank in the top 15), poor (those in the bottom 15) and average (everyone in between).